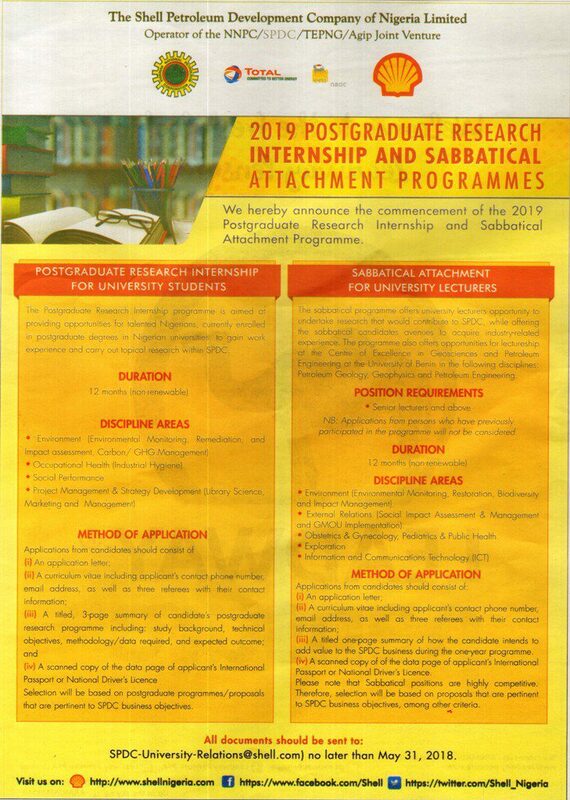 Shell Petroleum Development Company (SPDC) 2018/2019 Postgraduate Research Internship and Sabbatical Attachment Programmes for University Students & Lecturers. The programme also offers opportunities for lectureship at the Centre of Excellence in Geosciences and Petroleum Engineering at the University of Benin in the following disciplines: Petroleum Geology , Geophysics and, Petroleum Engineering. Note: Sabbatical positions are highly competitive, therefore selection will be based on proposals that are pertinent to SPDC business objectives among other criteria. Next articleOpenIDEO/BridgeBuilders Challenges 2018 for civil society organizations worldwide.